detection system that is currently available. FloodStopper water leak detection systems offer peace-of-mind and fully-automated water leak protection for your home or business. 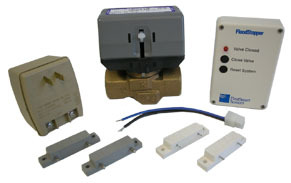 Each FloodStopper system features a controller, water leak sensor, and an automatic water shut-off valve. It quickly detects water leaks and turns off the water supply to prevent water damage. Unfortunately, the FloodStopper water leak detection system and related accessories are currently unavailable. If you require replacement parts or accessories for an existing FloodStopper System, several H2O SOS leak detection system compnents are compatible, including: standard sensors and wireless sensors / accessories.